The new fad for casual wear this season is distressed band t-shirts. They’re edgy, inexpensive and can even be made at home! The Kardashians ripped trend has become one of the most popular styles and a must have in every girls closet. 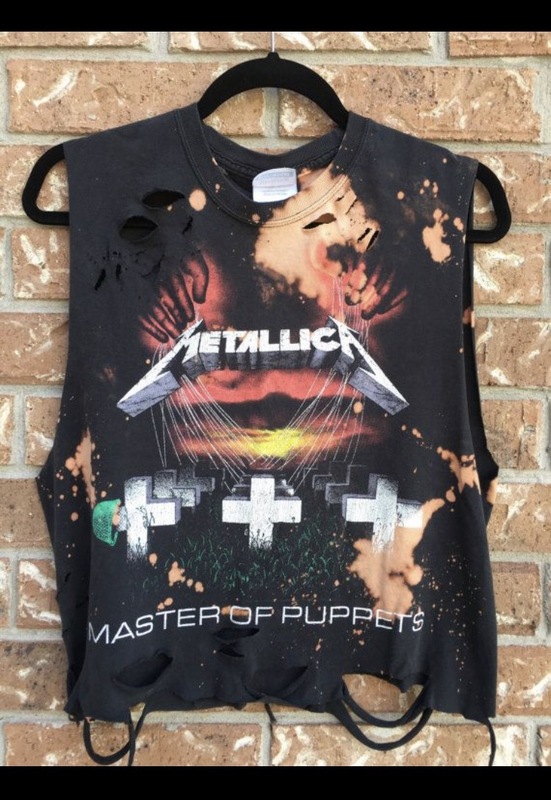 If you want to take on the challenge and test your creative abilities follow this DIY on how to make your own distressed band tee. First rummage through your t-shirt drawer and find any old loose fitting band shirt, that you would have other wise thrown away. (Do NOT try this with a beloved shirt, the detachment makes this project safe if you mess up!) Take this shirt and lay it flat on a table. Now get creative! Take a pair of scissors and carefully cut about 6 inches along the seam that runs at the bottom of the shirt. Do not cut the seam off. Pull the dangling piece until the fabric thins out and has a old torn appearance. Once that is done, take the scissors and cut little holes that are about 1 inch in length each. Group these holes in close proximity of each other. You can make them as sporadic as you like. I would suggest placing them in a corner of the chest along the neckline, just below the shoulder, and in groups in the bottom corners of the shirt. Take the areas that the holes have been cut into and pull, making the cuts look more organic and worn. Lastly, I would suggest recreating the neck line of the shirt. There are a few ways that this can be done. You can either cut sporadic holes in the seam of the neckline or you can cut the entire thing off and make either an off the sholder or v-neck. Remember this is not a uniformed look, keep everything random and messy. Feel free to also drip some bleach on the shirts if your feeling a little risqué.